Trampoline Classes are geared towards ALL skill levels and we train the fundamentals of trampoline tricks to ensure safe progression. Who doesn't want to learn a backflip?! Suitable for anyone 4+ starting at your current level and working your way up from there following our leveling system. Students must pass each level before moving onto the next set of skills. We start you from the very basics on the trampoline and we work your way up to flips and all kinds of inversions on our competitive fly-bed trampolines. Canada's first all-in-one, year-round Skiing and Snowboarding Training Facility. 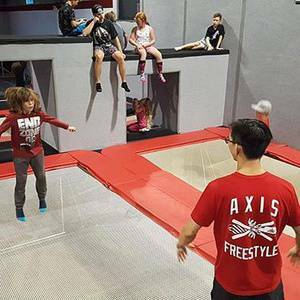 Located in Vaughan ON, the facility is equipped with a dryslope hosting a variety of jumps and rails, high performance trampolines connected to a 20x20' foam Pit.